Knee walkers are great tools for seniors that help them get around inside or outdoors without struggling with any sort of knee pain or injuries. They’re also great for anyone who just had surgery or injuries anywhere below the knee. These awesome mobility devices keep them stable while walking (or rolling, if you will) and act as a comfortable, easy to use alternative to crutches. Crutches are terrible for seniors because they put unnecessary pressure on the shoulders and wrists. The knee walker alleviates that issue, with simple handles and most of the motion coming from the wheels, not your arms and leg. Read on to find some of the best knee walkers particularly suited for the outdoors. If you are or know a senior who likes to spend a lot of time outside, but may be limited by knee pain or injury, this tool can really improve their quality of life and allow them to enjoy the outdoors with freedom and confidence. KneeRover is one of the most popular brands of knee scooters, making all kinds with alternative or deluxe features. This is their best selling knee walker, and it’s incredibly highly rated by users. It is a steerable roller with two braking systems – one at the front with an adjustable locking handbrake, and another rear disc brake. 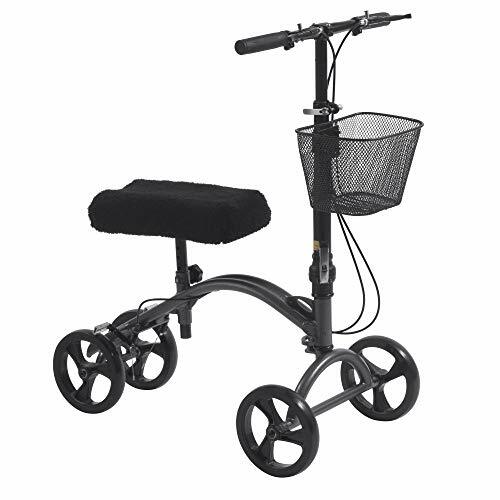 The handlebars are ergonomic and fold in easily for storage purposes, and despite its compact build, it can hold a whopping 300 lbs., so it’s suitable for seniors of any size. The knee pad is 3.5 inches thick and contoured to fit either knee. This knee roller also comes with a free basket to store your things and bring them along with you outside! 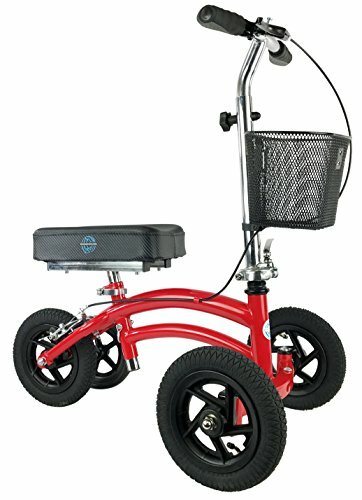 In terms of outdoor features, the wheels of this knee scooter are designed for indoor or outdoor use. The four wheels are 7.5 inches each, and made out of rubber that won’t markup any surfaces. The rubber is tough enough to be durable and handle outdoor conditions as well. Drive Medical is another well-known senior mobility brand, making everything from wheelchair/walker combinations to this great knee walker. The advantage of this model is that the wheels are slightly bigger, at 8 inches each. They’re also made out of rubber. Other than that, this knee walker can also hold about 300 pounds. It’s made out of aluminum, which is a very sturdy, durable material. It also has easily adjustable height features, as it doesn’t need any tools to adjust the height of the seat or the handles, both of which can be adjusted individually to fit seniors of any size. The steering column folds up for easy storage as well, and this knee walker is also slightly cheaper than my first pick. While this Swivelmate knee walker is much more expensive than other models, it gives you greater maneuverability as well, so if that’s something you value (which I assume is the case if you’re looking at knee walkers), this is a good investment purchase. It offers a full 90-degree turning radius, allowing you to use it easily in tight spaces and around the house – even in a small bathroom. The wheels are also designed for indoor/outdoor use, all four made out of rubber and are extremely durable. They’re only 7 inches, but you don’t necessarily need large wheels to effectively maneuver the outdoors. Other specs of this model include a 3 inch padded knee seat that has an easy height adjustment feature. You can also adjust the steering column up and down to adjust for height, and also front and back to account for shorter or longer arms. The braking system of this model is high powered as well, with a disc brake at the back and dual hand brakes near the handlebars. This knee roller gives you the most versatility, by far, out of any of these choices. Heavy duty double bar construction offers unprecedented strength and stability for a knee scooter. 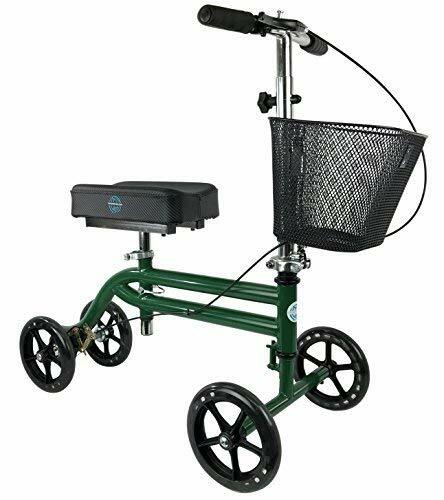 All Terrain KneeRover knee walker offers a 250 lb. weight capacity and is recommended for individuals with heights 4'3" - 5'9". If you need something a little smaller than the model above, this knee roller is made for more petite adults who still need that added knee support and maneuverability. Ironically, this model also has the largest, most heavy duty wheels out of all of my picks! The wheels are indoor/outdoor all-terrain pneumatic tires, measuring 9 inches tall. They can navigate anything from tile or hardwood floor without scuffing it, to gravel, dirt, and gaps in sidewalks easily. They knee platform and handlebars are all fully adjustable, and the double bar construction of the device itself gives it extra stability and control. It has about a 250 lb. weight capacity, and is suitable for adults ranging from 4’3” to 5’9”. Looking for a little extra comfort out of your knee walker? Sometimes the rubber padded cushion just isn’t enough, especially if you have knee pain. If this is the case for you, check out knee pad covers like this one. 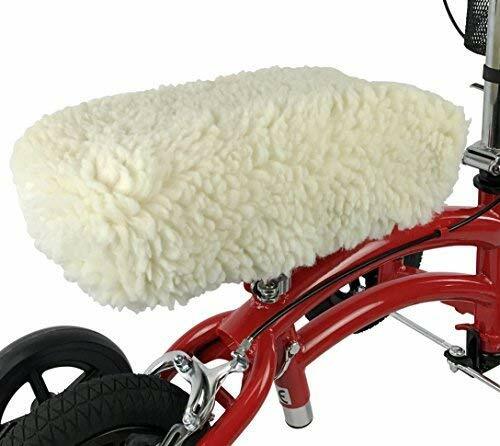 It’s made out of soft, comfortable sheepette fleece to add warmth, comfort, and extra softness. It acts as a second cushion for your knee, reducing friction on the skin and distributing pressure more evenly across the cushion. It’s easy to install, with a simple elastic edge that grasps onto the knee platform of the roller. It’s also washing washable as an added plus. Knee walkers, also called knee scooters, are a type of walker that allows the user to rest the injured leg while pushing with their good leg. You can learn more about knee walkers and how to use them by clicking here. Rollators are also great mobility devices to use outside – click here to learn more about those. 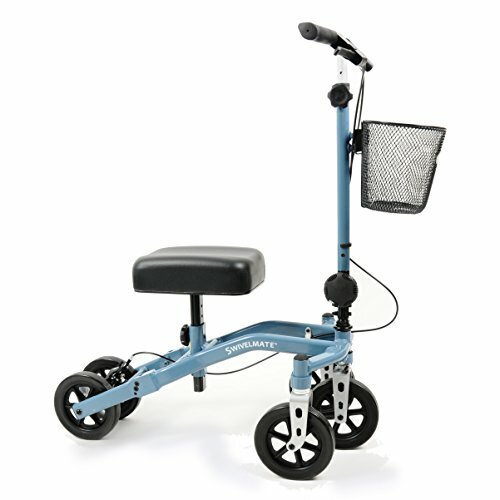 Personally, if I was looking for a high-quality knee walker to get me around my house and around the neighborhood, I’d go with the Swivelmate model. It gives you the most features and versatility and accommodates almost any size adult. What’s your favorite knee walker? Do you have any tips for living with a knee or ankle injury? Share below or on your favorite social media!